Produce is in full flower at the moment. Mange tout and the potatoes in particular. Everything is struggling with the dry and very hot weather. (24 degrees!) Been watering every other day to keep everything tip top. 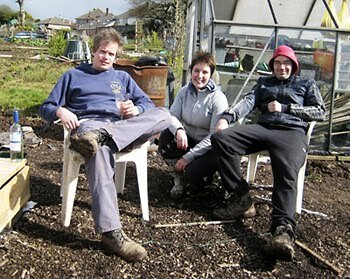 Bloody hard work with watering cans but that's allotment rules. My broad beans are still dying rather rapidly. I haven't got the foggiest why they seem to be wilting so badly but I have managed to get a half decent crop from them. Probably the only crop I will get this year unfortunately. The latest spell of fantastic weather also means that I can't dig any more for planting. That means no squashes this year unless the weather cools a bit. It is unbearable enough just weeding in high temperatures so I'm definitely not digging! Ugh! I've planted some sweetcorn and some very late runner beans but hopefully they should do okay. Fingers crossed!